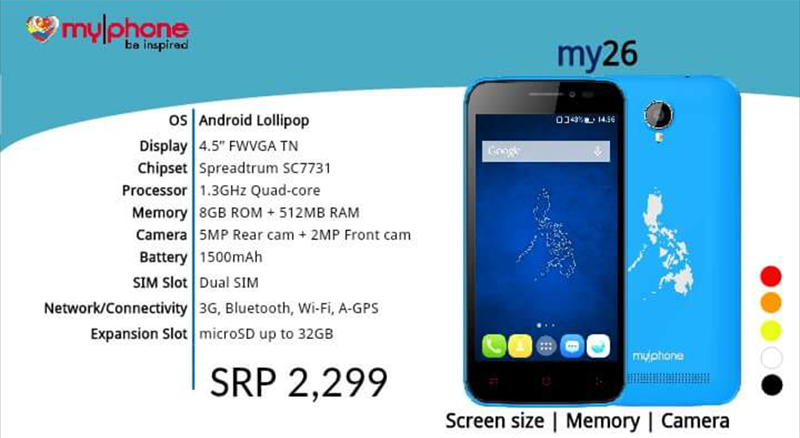 MyPhone My26 Spotted Too, Low Cost Entry Level Android Device With 8 GB ROM Priced At 2299 Pesos! Home / leaks / mobile / myphone / myphone my 26 8 gb rom / myphone my 26 price / myphone my 26 specs / myphone my26 / news / MyPhone My26 Spotted Too, Low Cost Entry Level Android Device With 8 GB ROM Priced At 2299 Pesos! Often, the criticisms I've heard from MyPhone users with devices that's priced at 3,000 bucks or lower is the lack of internal storage which is understandable for the price. However, the guys from MyPhone listens to what their customers needs. They will be unveiling the MyPhone My26 soon, an entry level 4.5 inch phone with decent specs and large 8 GB of expandable internal storage for the very low asking price of 2,299 Pesos. When released late this October or early November of 2015. This might be the phone for people who want a decent device on a very tight budget.